Great to be given the chance to contribute to this piece in the current issue of the APEX ‘Experience’ magazine. 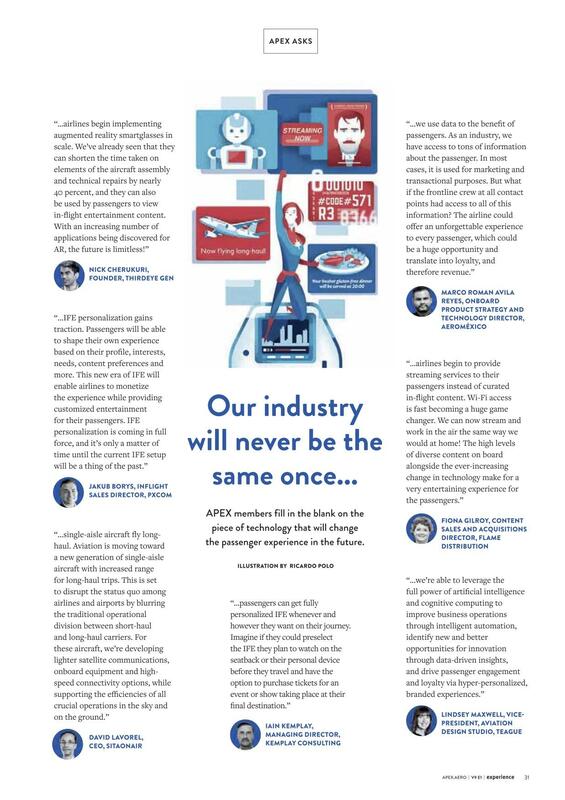 Personalisation of IFE content, online streamed access to own Spotify, Netflix et al accounts, growth of AR, the value of data and all across the whole travel experience – that’s the thinking! On the 5th November I presented a session titled ‘The Value, Impact & Opportunity for Using Local Music’ at the APEX MENA conference in Dubai. One of the themes of the conference was ‘localisation’ and I wanted to explore the use of Arabic label music on MENA based airlines and what the opportunities are. To provide local music knowledge and market insight, I am grateful that Karima Damir, Artist Development and Marketing from Sony Music Entertainment Middle East and Sylvain Mahy, Digital Director and Publishing for Universal Music MENA both joined me as panelists. There is a healthy growth in Arabic record labels and this is challenging the dominance of the traditional big two labels. New labels like Qanawat and Music For Life have emerged strongly and the major labels are now starting to invest and develop new local artists (see graph at below). 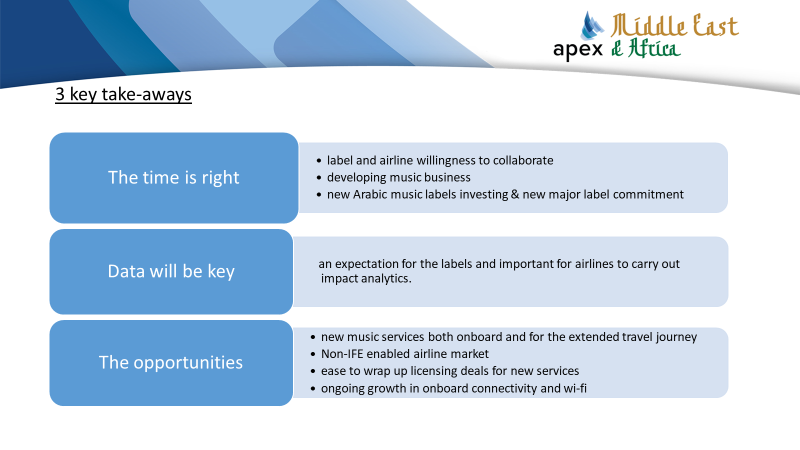 However, the use of Arabic label music on MENA based airlines does not reflect this changing market growth and, yet, these airlines are clear in their interest in working with Arabic labels to ensure they get the best and widest representation of Arabic music on board their inflight entertainment. As a broad marker, most airlines music content will carry about 10% of local music, rising up to 40% for airlines with small inflight entertainment enabled fleets. Predominantly this is the Rotana catalogue and, while Emirates has regularly promoted the Dubai International Jazz Festival and Etihad the F1 Rocks festival and Qatar Airways the Royal Opera House performances, there are few examples of a MENA based airline committing to promote Arabic artists. We know from the great local music promotions run by Virgin Atlantic (George Ezra, Paloma Faith), Air New Zealand (Lorde and others) and American Airways (Austin City Limits) that these can work really well for airlines and labels/artists. My panelists Karima and Sylvain definitely see the opportunity and some of the airlines I spoke to showed interest too. It would be great to see some new Arabic artist given full promotional support by a MENA bases airlines soon. Time to launch into stage three of my odyssey through the use of music in inflight entertainment (IFE). This will allow us to provide services and continue to discuss with the IFE industry about the ongoing and new service types of music content. The last few years have seen a transformative change in the supply and licensing of music for use in IFE and it remains a challenging and complex area for airlines, their content service providers (CSPs) and music rights owners to step through. We will be providing services to airlines, CSPs, systems providers and music rights owners on the use of music in IFE services. The journey of discovery began while I was at PRS for Music in 2011 and we began a ‘lifting the lid’ project on how airlines, with a particular focus on those in the Gulf States, were licensed for the use of music onboard. What we uncovered was that the licensing of music was incomplete, inconsistent, disparate and failing to meet the requirements of both the airline industry and music rights owners. But where there is challenge there is also opportunity and I found myself well positioned to work with Global Eagle Entertainment, the world’s largest CSP provider of IFE services, to introduce industry defining new music rights licensing structures. It proved a fascinating and illuminating experience and gave me a deep understanding and insight into the licensing of music for IFE, the technical provision and delivery of music content to the airlines and the new ways music could be used on different media platforms through the whole travel experience. Strategic guidance on the provision of music in IFE and the development of new music content services. Expertise in defining music licensing requirements and delivering the best industry licensing solutions. Working with labels and music content suppliers to look at new and more compelling ways to provide music content both within IFE and throughout the full travel experience. In a continuing environment of challenge and potential exposure to liability, to carry out comprehensive audits and compliance reviews of the extent to which appropriate music licences are in place. It is a couple of months since it was published but it is well worth checking out the article Cashing-in-on-ideas published in the UAE’s Gulf News on 19th May. Worth checking out if you have an interest in the creative industries in the UAE and are looking for signs of the rumoured green shoots in the desert and to then consider if there is sufficient ground water to sustain creative output. The article sets out the UAE’s real and well funded interest in promoting innovation and entrepreneurship in business, recognising the vitality of innovation to developing new business structures and market opportunities and the positive impact this can have on the economy. Two of the Abu Dhabi companies highlighted as recent beneficiaries are the music publisher and services company PopArabia and Trucial States, the film and television production company, both based and started through investment initiatives with twofour54. I have known and had the pleasure to work with PopArabia’s founder Hussain ‘Spek’ Yoosuf for over three years, while I was at the UK music rights organisation PRS for Music. It is great to see the progress he has made in establishing the UAE’s first fully fledged music services company, representing many of the worlds biggest international publisher catalogues. He is a genuine entrepreneur and has worked hard and with vision in a difficult landscape for music companies and intellectual property (IP) owners, so this is a merited and well deserved public recognition. In the article, Shaikh Nahyan Bin Mubarak Al Nahyan, Minister of Culture, Youth and Community Development is referenced on how innovation is vital to the economy and for setting out how the UAE offers assistance, advice, support and training to encourage entrepreneurship and innovation. This is exactly what entrepreneurs and business will be glad to hear but in relation to music and media the ‘support’ needs to extend to the the implementation of the UAE Copyright Act so that the intellectual property rights that both companies own and represent will be recognised and respected by the businesses which use their rights and content. The longevity of success that both PopArabia and Trucial States will be looking for is inextricably linked to the creators who create the great music and film and animation they own and represent and rely on for revenue. Until creators rights are better recognised, respected and valued then the realisation that this is a viable profession offering a secure environment and proper reward (royalties are the salary of creators) is not developed and this will undermine the level of creativity being generated locally and impact on the interests of the UAE government to develop local content to reflect the wellbeing of it’s society and culture. Both companies will struggle to realise their full potential and to be able to value the investments they have made, while the potential investment of international media businesses could well be compromised as they consider the lack of supporting industry structures which help respect and value the use of their intellectual property. This announcement of the emergence of PopArabia and Trucial States reflects well and now renewed attempts to develop the ecosystem of intellectual property rights ownership and management in the UAE need to begin. For the time being it is a brave place to be and a very difficult one to prosper in.